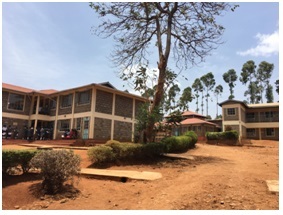 On March 9th, Umande was able to send representatives to the Ngaru Girls High School in Kerugoya, an all girls boarding school a little over two hours from Nairobi. The facilities here (a bio-digester 84m3, renovated 20 toilets, biogas piping and burners) were built last fall and opened for use since November 2016. As one of the several boarding schools utilizing the bio-centers they were pleased to see the facilities up and running efficiently. Mikayla, our new intern, and Gladys, our sanitation marketer, were able to tour the property and meet with two kitchen staff members, Muthi and Mwaii, the school nurse, Pascaline, and a member of the cleaning staff, Margaret. The Umande Team were impressed with the overall cleanliness of the toilets and the kitchen and the excellent conditions the infrastructure installed by the organization were in. Through an open conversation with the staff members they were able to gather information on the success and the possible future improvements of the bio-sanitation model. While Margaret reported initial difficulties with the students using the toilets correctly, she says after several reminders the girls have been utilizing the toilets properly with no issues whatsoever. Muthii and Mwaii both were overjoyed to report that the biogas has been a tremendous help and now they are able to cook all the staff meals using it. 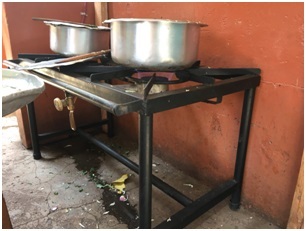 However, the biogas cannot yet be used to cook the students’ meals because the biogas burners are not large enough to thoroughly cook the large cooking pots the students’ food is prepared in. Despite this, the biogas project (from human waste) has enabled the school to use less firewood for cooking which helps the environment and decreases smoke inhalation for the staff as well. Overall, the staffs had little to no complaints and were grateful for our visit and overall help with the project.